GRECE – Losoudi of Asterousia - An important center of literature and education of the Byzantine years, which could be considered as the first Greek university, was excavated by Professor Ath. Paliouras in the location Losoudi of Asterousia, in Heraklion regional unit, at an altitude of 880 meters below the top of Kofinas Mountain. According to FlashNews, the excavation revealed the monastery of the Three Holy Hierarchs that was founded in the mid 14th -Century, by the scholar monk Joseph Filagris, who was one of the most important commentators on Aristotle. 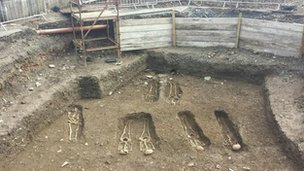 ROYAUME UNI – Londonderry - The Northern Ireland environment minister has announced a two-week extension to an archaeological dig in Derry that uncovered 13 skeletons last week. Mark H Durkan said the dig will continue until 11 October. It has been suggested that the skeletons may have been there since the 17th Century. The work is being carried out at a car park adjacent to the city walls and St Augustine's Church. Mr Durkan said: "The archaeologists are this week now discovering evidence of the settlement created by Sir Henry Docwra in 1600, which predates the walled city of 1613 onwards." Derry came under siege between 1688 and 1689. "The first find is of a flint tool known as a scraper, which would have been used to clean and prepare animal hides in the production of clothes or other goods," added Mr Durkan. "A piece of decorated pottery has also been recovered by the archaeologists and it would have been part of a large urn, possibly from a burial. "Both the finds date to the Early Bronze Age some 4,000 years ago and are the earliest evidence so far uncovered on the Island of Derry. INDE – Mysore - Nine megalith graves said to be from the Stone Age were discovered at villages of Hosaagrahara, Chunchanakatte, Kasaba and Mirle hoblis of K R Nagar taluk in the district on Monday. The rocks were found during a fieldwork carried out by S G Ramadasareddy, Prof M K Mruthyunjaya and others of Government First Grade College, Kuvempunagar. The megaliths and remains were found on the banks of river Cauvery in Gandhanahalli, Kurubarahalli and Lalandevanahalli villages. The rocks are 10-20 feet long. Shards of red and black earthen pots, bones, grinding stones, stone equipment etc were found near the megaliths. At a farm belonging to J N Rajegowda, two megaliths, 12 feet in length, were found facing each other. 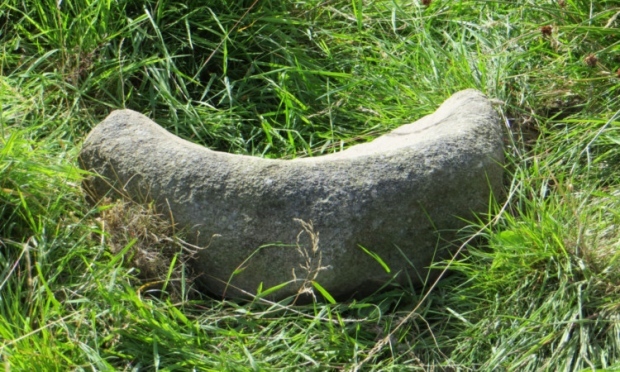 Another megalith found in Yelemuddhanahalli, was reportedly used for animal sacrifice. While the locals are of the opinion that the holes in the megaliths were made by their forefathers to conduct rituals, archaeologist Mahadevaia said research says that people from older ages made these holes to decide the time by sighting stars in the sky. The megaliths found here are said to have similarities with those found in Kerala, parts of Europe and Turkey. ROYAUME UNI – Balnaguard Glen - An ancient relic that shines a light on Neolithic life has been discovered on a picturesque reserve in Highland Perthshire. 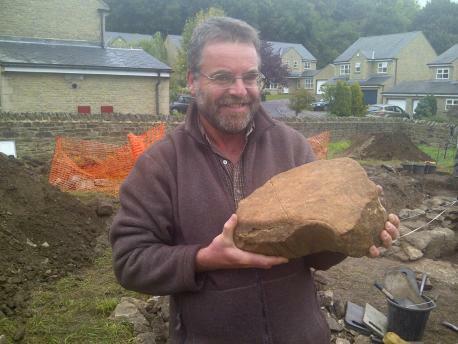 The Scottish Wildlife Trust made the exciting archaeological discovery while repairing a wall in Balnaguard Glen. Volunteers were working on field walls on the hillside when they noticed one of the wall stones was shaped like a shallow basin. It has since been identified as a possible Neolithic quern stone — potentially more than 6,000 years old — with its shape created by years of rubbing grain with a heavy stone to make flour. The conservation charity believes the find is good evidence that people once lived and farmed on the hill. It adds to the picture of prehistoric settlement illustrated by field systems, roundhouses, rock art and burial mounds in the glen. The quern itself is broken but it is hoped the other half may yet be recovered from the wall.